Buying a leather jacket is a large investment of any one’s cloth cabinet. Leather jackets don’t come cheap, and if a person is placing down that a good deal of money for them, they ought to be capable of getting something that is long lasting. One in all the most important mistakes that humans make while trying to shop for an awesome leather jacket isn't always buying it from the right emblem. Quite a few instances, manufacturers, mainly the online ones, claims to provide excessive-quit leather-based merchandise even though they aren’t the use of the material that they claim to be. Humans often get duped in relation to these products and are left with something that costs way less than what they paid for. Because of this, the first-rate approach is to constantly buy leather merchandise from a shop that is widely recognized and nicely reputed for his or her goods. William jacket is one site that is particularly known for the first-rate leather-based jackets that they produce. This brand gives jackets which might be fabricated from the exceptional leather, and which look and experience well. The appearance and sense of the product are enough to exhibit that an excellent quantity of labor has long gone into the manufacturing of the jackets that they put out. William Jackets introduces the Captain Cassian Andor Rogue One A Star Wars Story Blue Parka Coat. This jacket has viscose lining inside so you could be that in any kind of weather, even in the rain. Nylon material can give you some fortification in the volley. It has a blue color which is also an attention-grabbing tone for the public. Caption Cassian Andor ‘s jacket has fur cover and button end collar with an extra hold of belt heavy around the front of the collar. Captain Cassian Andor Rogue One A Star Wars Story Blue Parka Coat has a horizontal lining that makes it more stylish and unique as compared to any other kind of jacket.Inside the story of Rough One,All appears misplaced for the Rebellion in opposition to the Empire as they study of the life of a brand-new extraordinary weapon, the Death Star. Once a probable weak spot in its production is exposed, the Rebel Alliance must set out on a determined challenge to thieve the plans for the demise star. The future of the whole cluster now rests upon its achievement. 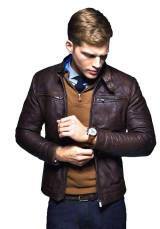 Just go to William Jackets.com and shop the best quality leather jackets. Don’t miss to take a look of Captain James Kirk star trek beyond jacket, Fine Star Wars jacket, Rey Star Wars the last Jedi vest and one of the most favorite Star Trek Discovery Uniform Jacket.